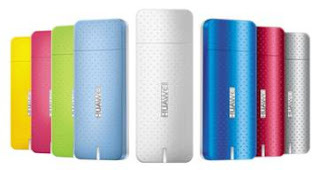 Huawei unveiled the world’s smallest data card – the E369 at Mobile World Congress (MWC) 2012. Measuring a mere 8mm thin, the E369 data card is part of Huawei’s thinnest product portfolio, which includes the world’s thinnest PC/CE module MU733 and MU739, the world’s thinnest mobile hotspot E5331 and the world’s thinnest smartphone Ascend P1 S.
The E369, created for UMTS 5 module global roaming, boasts a super slim chic design and is available in eight different colors. The MU733 and MU739, the world’s slimmest PC/CE modules, are less than 2mm slim. The MU739 in particular measures only 600mm2, making it the world’s smallest PA+ module. Not only are the MU733 and MU739 smaller and thinner than existing modules in the market, they consume less power and dissipate less heat. They can be widely employed in PC/CE electronic equipment, such as laptops, smart phones, tablet PCs, e-books, navigating devices and PDAs. Huawei Device will launch E5331, the world’s slimmest mobile hotspot in May.